Play it safe with this reflective vest with zippered pouch! This safety vest is perfect for construction workers, outdoor events, traffic control and more. One size fits most. Available in neon yellow, you can customize this item with an imprint of your company logo for maximum brand visibility any time of day. Protect your workers from a variety of hazards and select this reflective safety vest for your upcoming event! 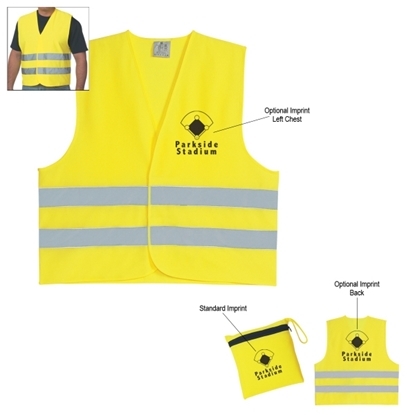 Mypromotionalpens.com offers the largest and best priced selection in Promotional Safety Vests. We will price compete and we won't be under sold. Let our graphic designers make your personalized Safety Vests standout above the crowd at no charge. We won't stop until you are completely satisfied with your custom Safety Vests art proof.Use category search filters on your left to help narrow your search to find exactly what you are looking for.